25th October 2015 – World 10,000m Champion Vivian Cheruiyot (KEN) and Commonwealth 10,000m Champion Moses Kipsiro (UGA) both took victories at the Great South Run in Portsmouth. In the annual race over 10 miles Vivian gave a demonstration of front running as she broke away from the field after only three miles and just continued to move further away as the race went on. Putting in a couple of mile splits under 5 minutes only confirmed her dominance and she crossed the line in a swift 51:17, nearly 90 seconds clear of second place. 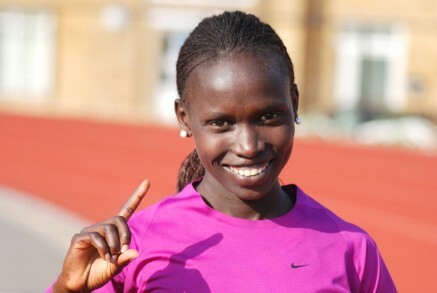 Doris Changeywo (KEN) used the race to take a small break in her marathon preparations and showed that she is also moving well with third place in 52:51. The mens race was a much tighter affair but Moses was able to use his superior track speed in the closing mile to win in 46:00. He led home a large contingent of PACE athletes as Emmanuel Bett (KEN) also made the podium in 3rd (46:11), Martin Mathathi (KEN) returned to racing after a long injury layoff placing fifth (46:16), and Chris Thompson backed up his win at the Great Birmingham run last week with eleventh place here (47:55). At the Frankfurt Marathon, Micah Kogo (KEN) suffered a nasty incident as he tripped at the 25km drinks station and lost valuable ground on the lead pack. Although able to pick himself back up and continue he never fully recovered before finishing tenth. Thomas Ayeko (UGA) made his debut at the marathon distance in Rennes, finishing fourth in 2:12:17. In the US, World Junior Champion Mary Cain (USA) continued her winter season with a run at the Boston Mayors Cross-Country where she placed third.